I have arrived in Istanbul, at last. 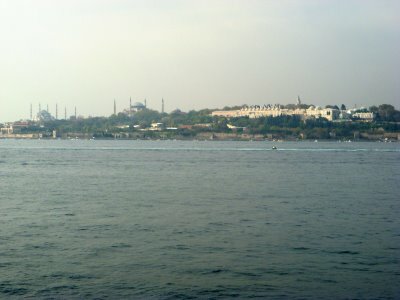 The landscape of Istanbul among the water is very delightful, everything I expected, even so, I am not a big fan of large cities, I do prefer the smaller towns. There is some hassle with people selling their goods, although it is much calmer than Egypt. Nobody bothers me though, I can put on the Turkish look—it’s easy, don’t smile, look angry, and don’t carry a day pack or a water bottle, and only quickly glance at people and the goods. Many times, once I speak English people are very surprised and say “You look Turkish”. 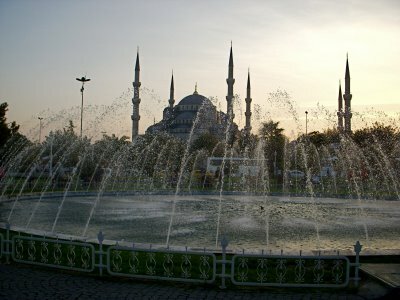 Istanbul is completely different in many respects compared to other parts of Turkey, except for the other big cities. 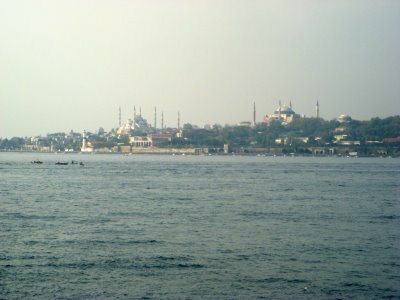 Istanbul is very touristy and busy with groups of people, it must packed during the summer. One noticeable difference is that the Turkish listen concerning why I cannot buy anything, next to the Egyptians that didn’t listen to the point of having myself blow my top toward the person. I will be staying until the 12th and then I will be taking a direct bus to Thessaloniki which I have a couch-surfing situation set up for two nights. I am working on finding a couch-surfing situation for Athens. I do have a situation in Tel Aviv with an Israeli woman and another woman said I could stay at her place, too. I am staying in a hostel in Istanbul—the room has six beds, and it is bearable, it took me a couple of nights to get use to the change from having my own room. I have been contemplating changing my style of travel for Eastern Europe, I am now into the strategic research planning stage. Once I get an idea, I think it over—I will look at the pro’s and con’s of the idea. Once I have an interest in pursuing the idea, I will enter the stage of strategic contemplation and research. Once I am determined to pursue an idea, such as slightly changing my travel style, I will execute the plan in a successful manner, although, the execution of the plan is after a long drawn-out thought process. I will post the details of my plan while I am in Israel. My thoughts on the election—I am not one to get to involved with elections, although this time I did pay attention to the political map and the projections of who would win which state, I did not listen, nor view any news concerning the elections. Over the past nine months the map changed within many states. The day before the election I viewed the political map, and the day after the election, I viewed the map—low and behold the maps before and after the election are identical. In addition, over 100 million Americans voted. So the whole world is happy—when I tell people I am from America, they smile and say, “Obama” with a thumbs up, although I wouldn’t expect that much change, every government is under the power of the wicked ones. Nevertheless, people don’t, nor do they want to understand the deeper layers of truth concerning the destiny of this world. The populace of the world just wants to be comfortable with good economics. I ran into two guys from America on the boat cruise up the Golden Horn, although they were Christian—the same judgmental mentality as the people I met in the East. I have decided, I will visit with people of mostly every religion, however, I will not talk religion with American mainstream Christians, they make me want to throw up. Oh, by the way, a person has to believe that “Jesus is God” or you are doomed, I guess all the Christians of the Middle East are not good enough from what these two guys were preaching. A totally disgusting judgmental dogma that the American Christians have cultivated. I will be posting one more post about Istanbul and then taking a break from blogging, although I will post short updates on my progress to Israel. I just uploaded close to 500 pictures on Shutterfly. Next post: Istanbul—One Year Completed. Previous post: Troy and The Trojan War.